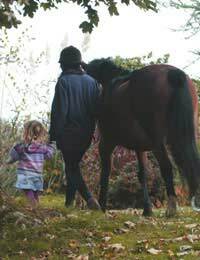 The role of a parent at the stables is not always easy to define. Whether the parent themselves has any experience with horses and stables or not, there are still issues which arise. If a parent has ridden before and they are trying to get their kids involved in horseback riding, then they may well think they know best and try to tell the stables staff and riding instructors what to do. Conversely, if the parent in question has no experience of horses or stables, then they may well be fearful of their child on the back of a horse and try to be over anxious. So what exactly is the best method of parenting when at the stables? Whether you are a rider yourself or not, the main thing you need to do at the stables, as a parent, is encourage your child. This does not mean being a pushy parent and getting in the way of stable staff. This simply means standing on the sidelines and watching your child and telling them how well they have done when they come over to you. It is also to be expected that your child may take a tumble or two. In these instances, the role of the parent is to encourage the child to get back on the horse and have another go. Remember, it is better for them to get straight back on. In this case, if you have any fears of your own, it is important not to let your child see them. Kids will pick up on their parents’ fears so put them to one side and trust the riding instructors. Another main role of the parent is organisation. Children cannot be expected to remember everything they need for each lesson. And, as they get more and more involved with horseback riding, they will have more things to remember each time. This may start with their hard hat – getting it and remembering to take it with them when they go riding. But eventually, it could be a multitude of things, tack, cleaning, mucking out, consent forms. The role of the parent in these cases is to make sure the child has everything they need and has time to do all the tasks they have to do. This extends as far as transporting the child to lessons and competitions as well. The more involved they get, the more they will need fetching and taking places. Here, the parent must provide that age-old service of mum and dad’s taxi to enable their youngster to carry on taking part. As with any sport, riding is bound to bring its fair share of disappointments to a child when they lose a competition they have worked hard for. But it is important to note here that the parent’s role is not to scold or criticise – that is the job of the coach. The parent should be on hand to console, give out hugs and congratulate them on how well they did taking part. While a child must learn where they have gone wrong, it is a bad idea for the parent to do this for two reasons. One is because the advice given may conflict with that of the coach who will usually know best and two, because the child should learn that taking part is as important as winning and therefore need someone, ie, a parent, to provide this viewpoint. As you can see, there is certainly a role for a parent at the stables, it may just not be the one some parents would like to carry out. But it is vital for the enjoyment of the child that the parent carries out the role of the parent and not that of the coach. If a child is to succeed in riding, as any sport, they must enjoy it, and parents can go a long way to making sure that happens.